We have discussed how you can easily start a fresh water shrimp farm in your home-based farm or commercial farm, in our previous blog: How to Start Your Own Shrimp Farm. 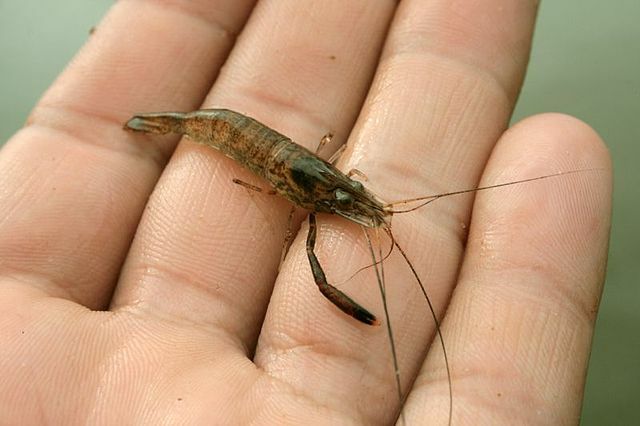 We have also covered some important aspects of water quality management, disease control and predator control in our previous blog titled: Freshwater Shrimp Farming- Managing Water Quality & Disease. This is the third article on freshwater shrimp farming, and in this blog you will find tips on harvesting methods, storage and economic feasibility aspects of freshwater shrimp farming. When carefully managed, freshwater shrimp farming can be a profitable enterprise. 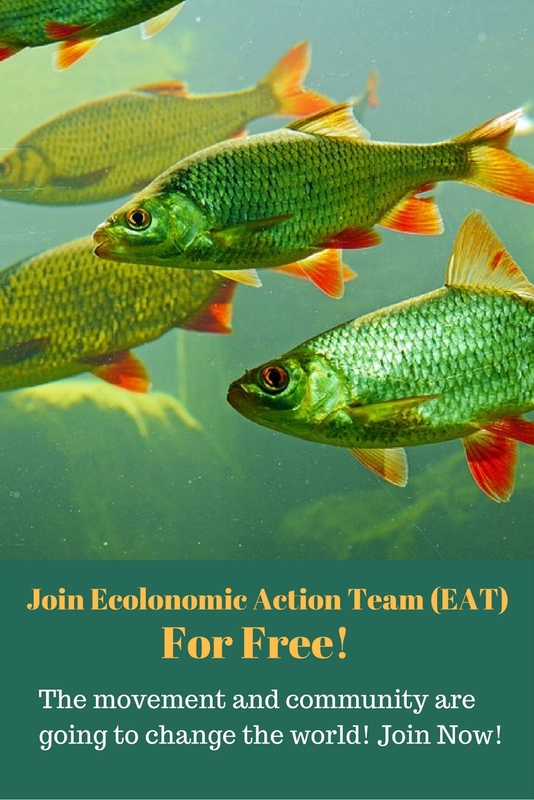 Most farmers that fail to generate a good profit lack in the knowledge and technical know-how of fish farming, particularly when applying sustainable methods for weed, water, feeding, and disease control. After your shrimp have grown to market size, they are ready for harvesting. Basically, there are two types of methods used for harvesting. The time of harvesting varies based on the growth rate and size of your shrimp. 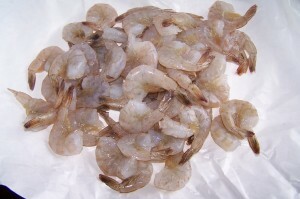 Market demand will also play a role in deciding when to harvest your shrimp. The harvest techniques you choose will also vary according to your farm management techniques. 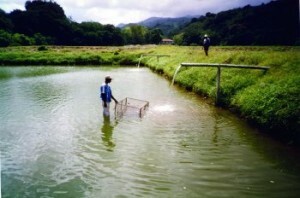 With this method, a seine net, usually made from mono filament nylon, is used to remove all market-sized shrimp. The net can be specially designed for this purpose, equipped with sinkers and floaters. The size of the net will depend on the size of your pond and your shrimp. A net which is eight feet high and 1 ½ times longer than the pond length is suggested for this purpose. The mesh size is recommended at 1.5 inches. You should be careful not to leave any gap at the bottom while pulling this net, or your shrimp will escape from under it. 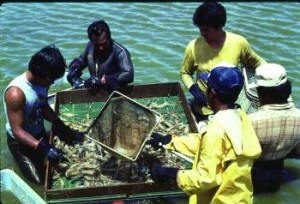 Take amounts of shrimp that the net can handle at a time, and transfer them into a cage or box. You will have to repeat the process of seining, keeping one end stationary and rotating the other end. To remove the faster growing shrimp from your pond at regular intervals, you’d use the cull harvesting system. The cull system is not very efficient in maximizing the total quantity of marketable shrimp though, because some harvest-sized shrimp can still be left behind in the pond and left longer than necessary. Usually, cull harvesting can begin within 5 to 7 months after the juveniles have been stocked. You should seine your pond once a month to take out full-grown prawns and leave the smaller ones, or the soft shelled shrimp for further growth. Drain your entire pond after 8 to 11months to get all of your shrimp harvested. It is not recommended to use water from one pond to another because you might transfer disease; refill the pond with fresh water. The drainage system is used to harvest all the shrimp from your pond at the end of a growing cycle. The efficiency and method of drain harvesting will depend on your pond size. You should draw down the water level of your pond the night before you plan on draining your pond and start early in the morning when the temperature is cool. If your pond has a slice gate structure for drainage, you can harvest your shrimp efficiently by including a catch basin or harvesting sump, in front of the gate. As you drain the water, your shrimp will accumulate in the sump. Be careful not to stress your shrimp with reduced oxygen levels, high temperatures, or overcrowding. If your drainage pipe is too small, many of your shrimp will be damaged before harvesting. A properly constructed pond will maximize your harvesting efficiency. If your pond does not have a drainage system, use a pump to drain the water from your pond. You’ll have to use screens to prevent the shrimp from getting into the pump. Use multiple seining after you pump out the water. You will also have to catch shrimp that retreat into the mud or get stranded in the isolated pool of water. Although freshwater fish farms have gained popularity in several states in the US, it’s still not a mainstream cash crop. Many farmers have been growing freshwater shrimp in their backyard ponds all summer. Although many farmers don’t have enough shrimp to make it to the store, they have grown highly palatable shrimp which are worth top dollar. It is important to match production levels and marketing strategies. If not, adequate storage facilities are necessary. Studies suggest that a specific marketplace for whole, freshwater shrimp needs to be carefully developed. Enough cold storage and a quick freezing method would ensure year-round marketing and preservation of this seasonal cash crop. Research also shows that it is possible to haul live shrimp in five gallon water containers for distribution. Currently, the cost of feedstock is $250-$300 per ton. Juveniles cost $60 per 1000,at 2.5 to 1 feed conversion rate. Expected rate of yield is 1,000 pounds of shrimp per acre. The selling price at the pond bank is $4.25 per pound, which gives an expected return of $2,000 to $2,500 per acre. Your ultimate revenue and profitability will greatly depend on your marketing strategies and farm management techniques. There might be other expenses and overheads associated with your farm, which are not included in this calculation. We hope that you have found our information on shrimp farming techniques valuable. We will be giving you more information on aquaculture and fish farming, periodically, in our later blogs, so please read our articles regularly. Thanks for being with us. P.S: – Please add your comments or any questions that you may have, in the comment box below. Now these systems seem to be strictly (land based) pond farming applications. I wonder what end return on investment and net gain per “acreage” you could get out of shrimp farming if you would combine it with an aquaponics system where (appropriate) plants consume the fertilizers that the shrimp produce while rejuvenating and oxygenating the water at the same time? Hi Darragh, thanks for your comment. An aquaponic system will definitely increase your profit. Please give us a call at 303-495-3705 for more information. Hi Sir, need your suggestion for improving. can you give me your proper contact no as i’m not able to contact you on you given contact no. can one train prawns in an artificial pound? There are a lot of factors that come into play when shrimp farming for profit. Would you like a free consultation call? I am Maheen Salman. I was looking for prospects of shrimp farming in Karachi, Pakistan , at the mangroves. I will be glad if you could share information regarding shrimp farming so that I can develop a feasibility study on it. We’d be happy to provide guidance and consultation for you. Someone from our team will contact you soon. Hi. How long does it take a juvenile shrimp to reach harvesting weight? Where can I purchase the mesh and seine net. I live in Iowa.I am interested in doing a back yard aquaponics garden. Where can I buy juveniles? I would like to eventually get some land and do a large passive solar greenhouse aquaponics system. Hi, I would like to know more about what you do, could we schedule a call? I want to go into shrimps farming,how do I go about it and where do I start from?pls help. Thank you.It’s so exciting to read you article and to know more about shrimp farming .. looking to read more from you .. I am interested in establishing a stacked tank freshwater prawn system that they have researched and developed out of the University of Kentucky. Do you have an information on this system? Also what type of water do you suggest? I have read about using tap water and conditioning it for use…chemical or evaporative techniques for removing chlorine? Is this advisable? Just started thinking of starting this up and been looking and reading on your site. I have a pond about .75 acre with an abundance of vegetation I know I have to remove any fish but what about the grasses? Also how juveniles would I need to stock a three quarter acre pond. Here is a fun article for anyone interested in harvesting crustaceans.